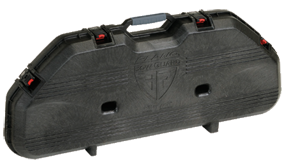 Manufactured from impact modified resin the Bow Guard All Weather case delivers the protection sought by archers. The patented PillarLock® feature provides unmatched support in the center of the case protecting your sight and rest. Featuring superior high-density foam, and multiple position tie downs you will find that almost all bows (traditional or parallel limb) will ride securely to the range or into the field. Elastomeric arrows. Elements are kept at bay as the rubberized gasket protects the interior from dust and rain. Measuring it at 48"L x 21"W x 7.5"H, the All Weather Bow Case has been engineered to transport bows up to 43" axle to axle.